This delicious and nutritious blend is made with honey roasted peanuts, crunchy granola protein clusters, honey roasted cashews, and wholesome roasted almonds. Each nut is fiber-rich and packs the energy you need to take on your day. After those intense workouts at the gym, your body craves protein. 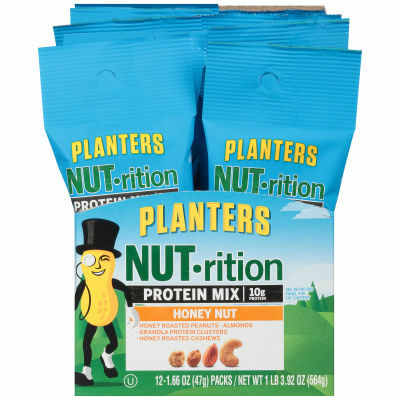 Give it what it wants with a single serving of Planters NUT-rition Hone Nut Protein Mix, a good source of protein with 10g in every serving.